The Schwartz Awards are a way for members of the Schwartz Community to celebrate their achievements. They give individuals, teams and organisations the opportunity to creatively express and celebrate the development of Schwartz Rounds within their organisation, demonstrate why Rounds are valued, and give examples of where they have proved particularly powerful. Creative examples of how Rounds have been implemented or sustained. Demonstrations of emotional, behavioural or organisational change. Demonstrating the impact of Rounds. Capturing moments that represent the power of storytelling. People who have made inspiring contributions to any aspect of running Rounds in your organisation. Use the tabs below to look through winning and shortlisted entries from our two previous Schwartz Awards. We hope this gives you inspiration! Deadline to send in entries is 1 March 2019. Winning and shortlisted entries will be displayed at our 2019 Schwartz Community Events. 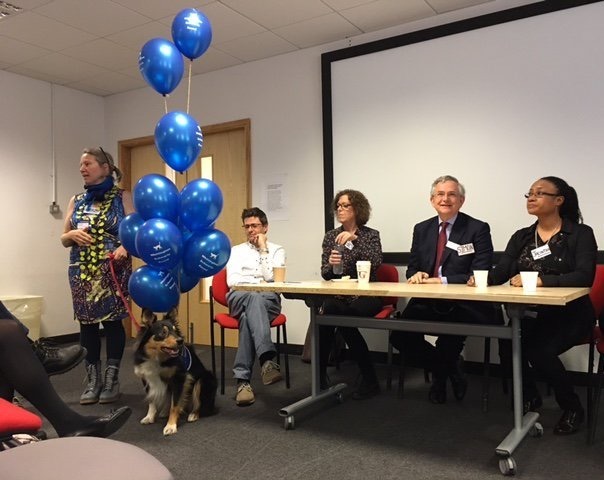 Imperial’s entry ‘opening doors’ acknowledged a lack of representation from senior managerial colleagues/ policy makers within the trust and began establishing various approaches to encourage engagement from this demographic – including getting involved at existing staff events. As a result: senior management attendance increased from 13%-28% and ensured more key supporters at executive level: including CEO and Director of Nursing. This project has also provided learning to be spread to other equally “hard to reach” groups including ward nurses and HCAs. 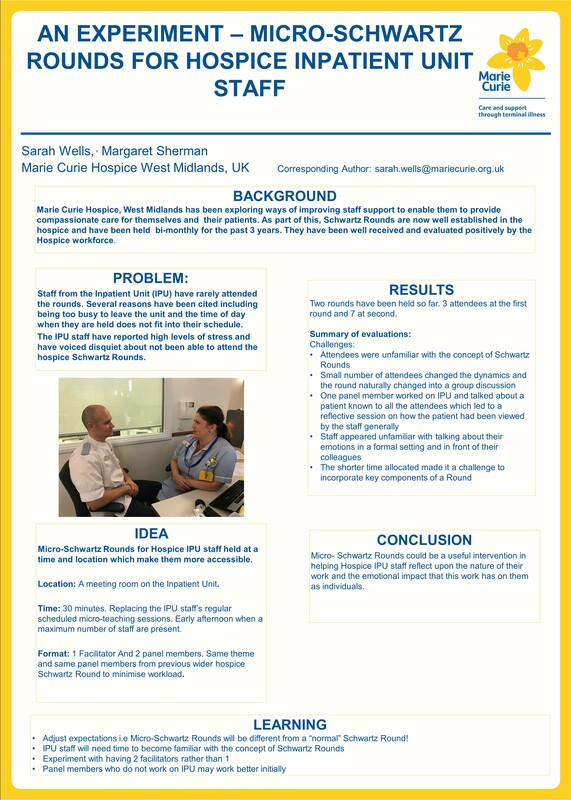 Derbyshire’s entry ‘Reaching out…Running Schwartz Rounds across a large rural community trust’, transcended logistical difficulties of running Rounds across a wide geographical area. It depicts an innovative and energetic plan for the future to continue to engage staff from all over the county and demonstrates evident commitment and support from admin and steering group. By continually building a network of clinical leads and facilitators, they ensure they feel supported and are able to perform their role well. Hammersmith and Fulham’s entry ‘Hugs’, captures some of the core components of Rounds. The photo depicts the way in which Rounds can create a culture of openness and promote connectedness between staff within an organisation. Morecambe Bay’s entry ‘Bending the Rules’, outlines a Round which gave a voice to Admissions Lounge Staff – who had the chance to illustrate the unique difficulties they face. 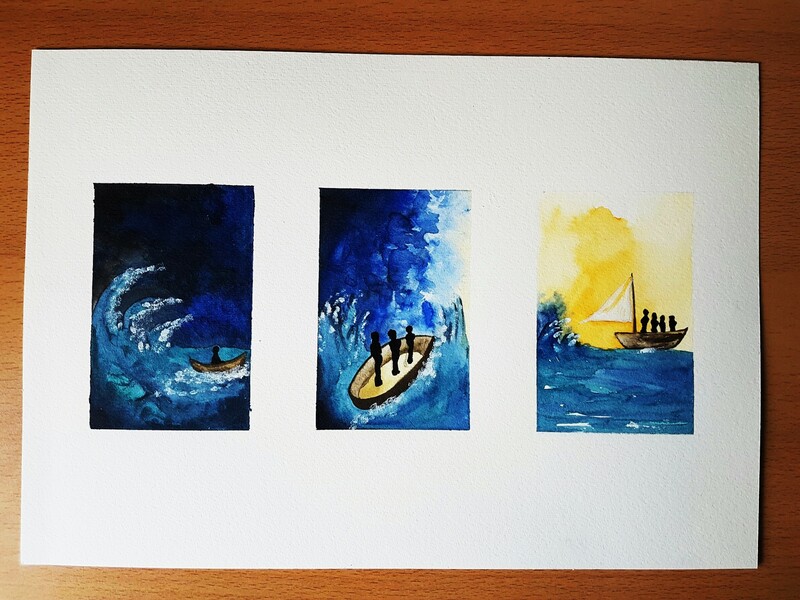 This submission demonstrates the potential ripple effects that can happen as a result of Rounds – despite maintaining Rounds as a non-problem solving space. It demonstrates team members gaining insight and understanding of panellists roles. 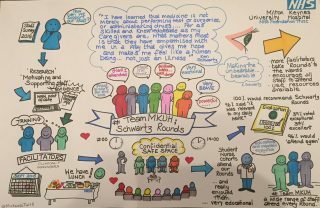 Michaela Tait’s poster portrays the journey and impact of Schwartz Rounds in a creative, clear and colourful way. 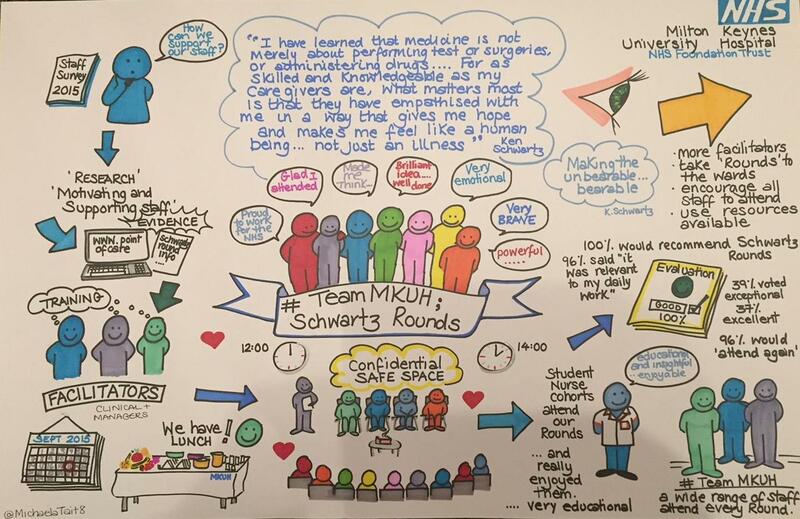 It includes imagery and information of all aspects of the Round and depicts a picture of a successful past an optimistic future for Rounds at Milton Keynes University Hospital. Michaela’s poster demonstrates that the reach of Rounds have extended to a wide and diverse range of staff and are valued by all where 100% would recommend Rounds. 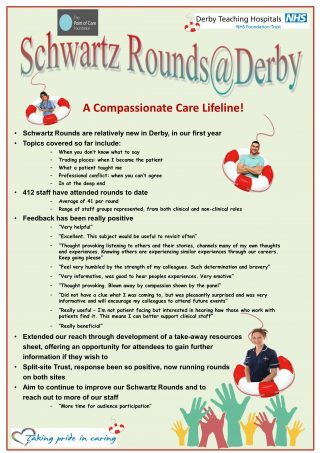 Derby Teaching Hospitals entry ‘A compassionate care lifeline’ portrays the journey and impact of Schwartz Rounds in a creative, clear and colourful way. 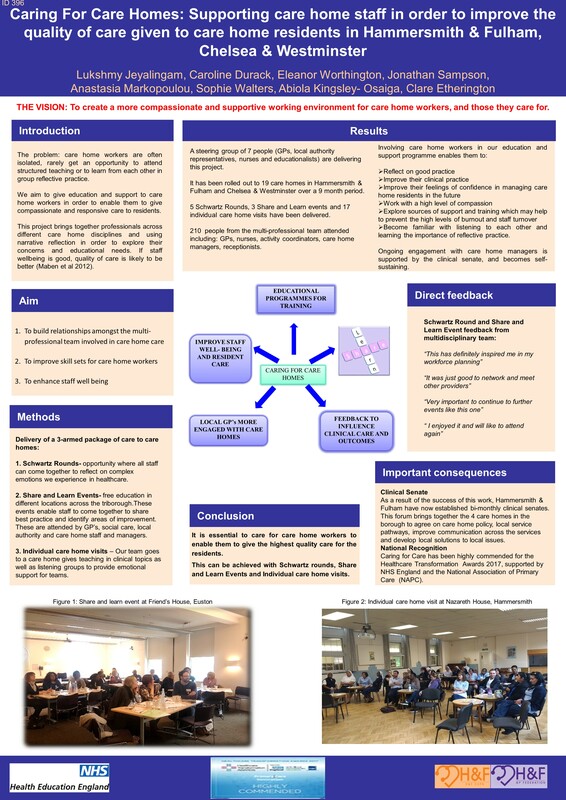 The poster highlights the positive past of Rounds in their first year – and an optimistic future with plans for more innovation and engagement. 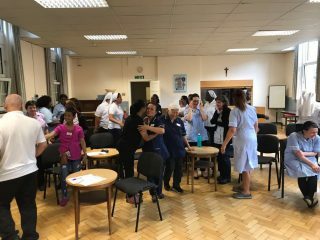 It demonstrates that the reach of Rounds have extended to a wide and diverse range of staff and are valued by staff who attend. We especially liked the staff members placed inside safety rings – cleverly and creatively depicting Rounds as lifebuoys for staff. West Hetfordfordshire’s entry identified Becky and David as individuals with “commitment, compassion, credibility, people-skills and indefinable magic”. 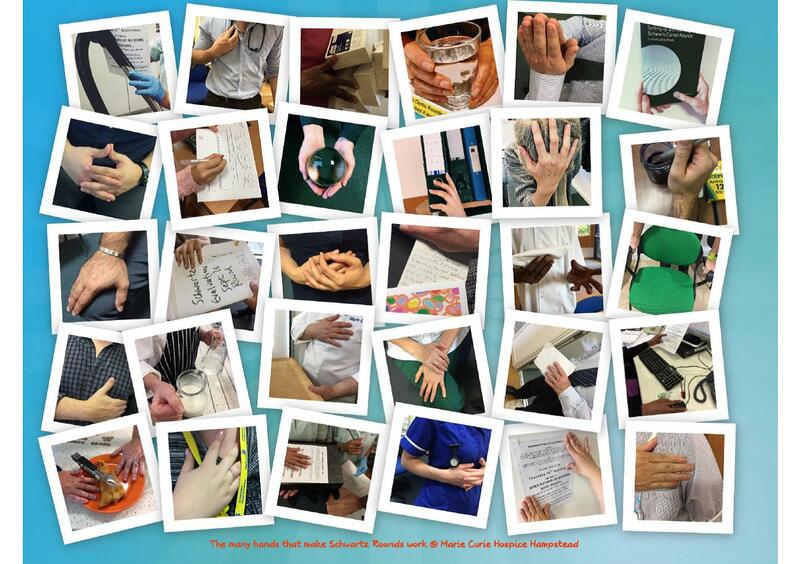 West Hertfordshire’s Rounds are very well-attended by a wide mix of staff and feedback is nearly always exceptional. 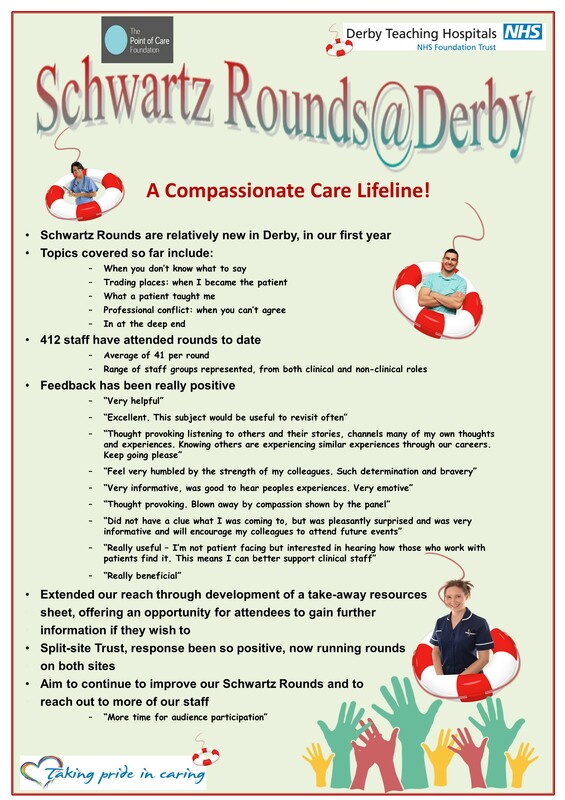 They describe Rounds as being “probably the most important thing we do to support our staff”. The entry describes Becky and David as having a truly inspirational partnership. The eye-contact and ‘language’ between Becky and David shows their intuitive and warm relationship. Derbyshire Healthcare’s entry is a star studded, eye catching display. It highlights Graham’s dedication to sustaining Rounds – over a 6 year period so far. Graham is praised for mentoring others to help them embed and sustain Rounds and for bringing his own home-made pate to Rounds! Ashford and St Peter’s were the first to create the concept of ‘Pop-up Rounds’: they gauged staff experience and directed staff to a form of Schwartz Rounds which was accessible to them. Their innovation has also helped to inspire many other organisations to run pop-ups. Farhana’s video beautifully demonstrated the process which led to this innovation, and also inspired the possibility of future innovations. The University of Liverpool were the first to introduce multidisciplinary Rounds into their undergraduate curriculum, running Rounds to students from a range of education programmes. They are helping to address the important task of introducing reflection and openness to share vulnerability early on in training, and it is the importance of this innovation in enacting change that resulted in them winning the award. Yusuf’s photo beautifully captures some of the core components of Schwartz Rounds in just one photo. It also emphasises how labels and hierarchies are not the focus in Rounds since they are an opportunity for sharing human experiences. The photo also stresses the need to stop and take time out in order to reflect. This entry demonstrates how a simple photo can bring a story to life in your mind, with the image recalling Aoife’s memory of her final physio session with a dying patient who was in too much pain to get in the water: Aoife recognised that just sitting with the patient, just being there, was enough, and could in fact do more to relieve the patient’s emotional trauma than any treatment. The photo captures this sense of stillness and presence as something so simple and pure: the connection between two people in a peaceful space. 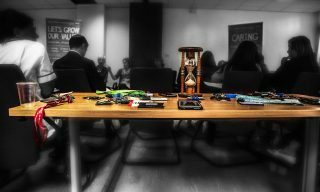 West Herfordshire’s entry described the brutal reality of helping children who have suffered terribly, capturing the profound impact that one particular case had on staff within their organisation. 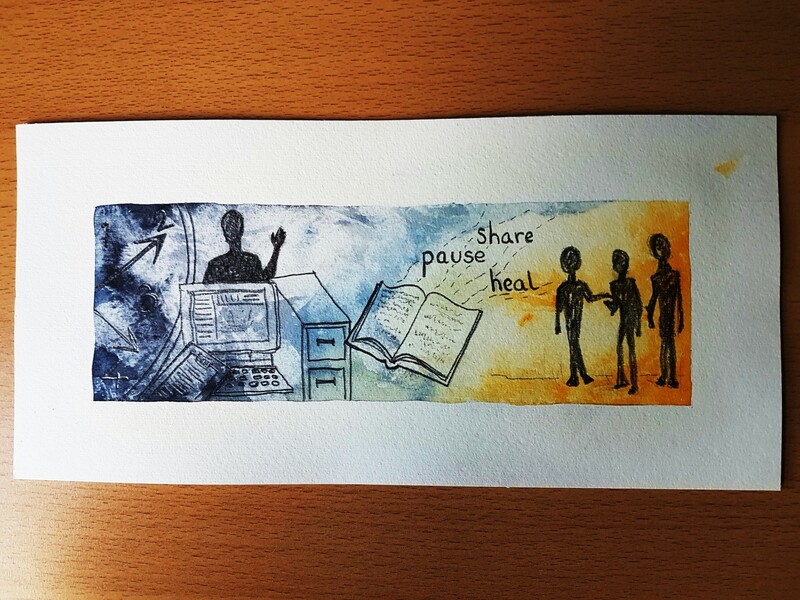 It captured not only the power of Rounds in encouraging staff to open up and unite, but also the power of storytelling in inviting the opportunity for reflection. The Christie’s entry, a story told by porter Robert Hardiman, highlighted the often unheard but vital connections that are formed between non-clinical staff and patients. The story also demonstrated how sometimes none of us really know what to say to patients, but that a connection can nonetheless exist. Most importantly, Rob’s story reminded us that connecting with patients on a human level and not shying away from the feelings that come with those connections is extremely valuable. SLAM undertook a thematic analysis to explore how the Rounds were experienced by staff. They identified why Rounds were valued, what the benefits were, as well as the barriers to implementation and proposed actions for ongoing sustainability. This was all creatively displayed using the image of a tree. 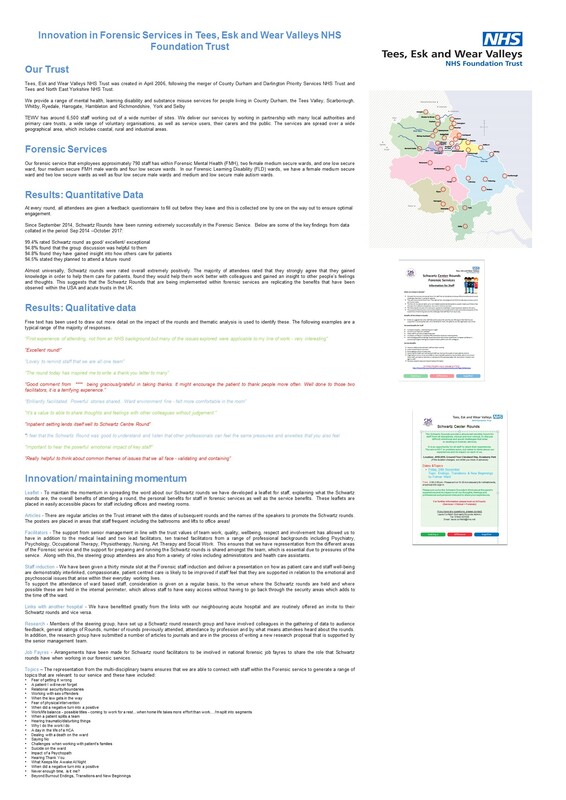 Wirral’s poster laid out the feedback that they had received from Rounds in a clear and simple way, also detailing wider organisational measures. They also summarised feedback comments in a visual-friendly wordgram, thereby bringing the experience of Rounds to life. This photo conveys the power of the Rounds to bring people together from across the whole organisation. 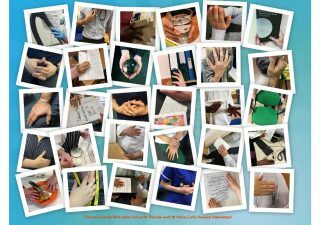 The photo is a collage of 30 hand shots, showing the hands of those who contribute to the success of our hospice Rounds. Together they capture moments of connection, which not only ensure the safety of our Rounds, but are also responses to the storytelling made possible in them.